Yesterday I sang praises for Skyward Sword‘s game world and its steps towards a denser and more dangerous Hyrule. If you were wondering why the article was so short, it’s because there’s a lot of stuff that falls under the diverse blanket of “user discovery,” and based on the demo, that’s another of the game’s strong traits. 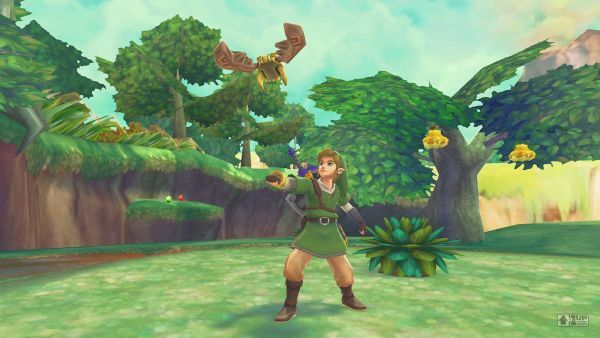 There’s a lot of Zelda series traditions from both the classic and modern entries that could return in a fine-tuned, better-than-ever way in Skyward Sword. And today, they’re all about the player’s experience. I’ve already touched on the wide variety of enemies present in the Skyward Sword demo, but what I haven’t talked about yet is how the developers have gone to great lengths to make fighting these enemies an integral part of the game action, more so than in previous 3D Zelda entries. Every bad guy seems to have been designed with care; they all fight you in their own unique way. The most famous of the new examples are the Deku Babas, which based on the alignment of their heads have to be slashed in a certain direction in order to score a hit. 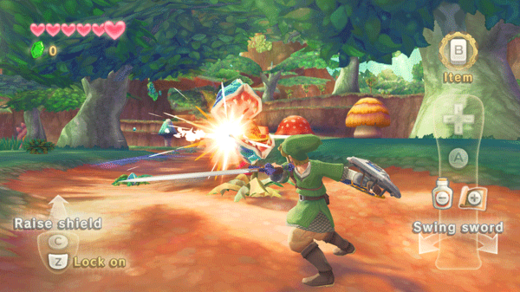 Already this adds a new dimension to the combat, since rather than performing general sword slashes as we could in Ocarina of Time, we now have to coordinate our moves based on context. You probably knew all this already, but did you know that you can also fight the Babas another way? If you chuck a Bomb at them with the proper precision, they’ll unsuspectingly scoop it right up in their mouths, with the expected results. Finding new ways to use items to defeat enemies seems to be the name of the game this time around, a nice change over the other 3D games where this wasn’t encouraged quite as much. Hopefully the Deku Babas are a good sample of how we’ll be able to vary our strategies for fighting enemies elsewhere in the game. I’ve already talked a little about how Skyward Sword‘s world, at least based on the demo area, has a much more non-linear feel than other titles, but it has all kind of implications in this area. Right from the get-go, you can go basically anywhere in the forest – you can wander around fighting enemies, you can go to fight the area’s various bosses, you can even try to climb up to high places like the borders of the area. You’re not forced to do anything in any particular order, either by the world’s design or by a series of gameplay objectives that must be completed in sequence. This kind of open world approach is exactly what made Zelda famous in the first place. Players were free to explore and discover things at their own pace rather than being pushed along by story constraints. Now, of course, we’re likely to see much more story presence in the final game (indeed, I should hope so, since the demo area was completely devoid of text), but that they structured the demo with this “do as you please” mindset rather than a formulaic “try to complete such and such task” framework like previous demos have done is encouraging. There’s been some buzz about Will Wright’s recent statement that video games are not the proper medium for artists to tell stories, and I think that a lot of his critics are missing the point. He’s not saying that a good game can’t tell a good story. All he’s saying is that video games, the truly timeless games that people have passed down to their children, are the ones where the story comes from the player, not from a prefabricated experience. After all, video games aren’t Hollywood movies, although recently it seems a lot of them are aiming to be considered as such. 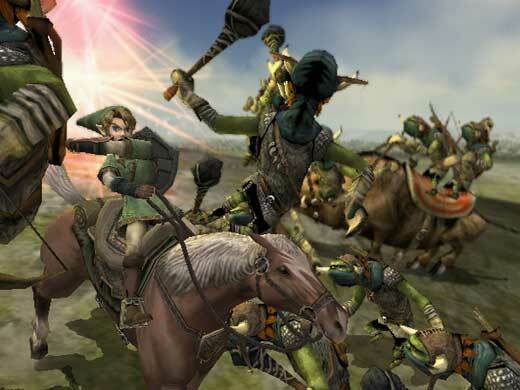 The early Legend of Zelda games didn’t need a lot of gorgeous cutscenes and dialogue to weave an intricate hero epic. All they needed was an appropriate setting and tools for the player to discover the secrets of Hyrule on his or her own. Sure, there were characters, events, and a plot that laid down the groundwork, but everything else was up to us. If Skyward Sword can pull off that kind of storytelling, coupled with an open world where everything is at our fingertips, all we’ll need are the intuitive puzzles the series is famous for, the plentiful hidden caves and Fairy Fountains of Ocarina of Time and Twilight Princess, challenging mini-dungeons like those found in The Wind Waker, and rewarding secret items like those from various games throughout the series, and we’ll have a true winner in terms of that feeling of discovery.